I was looking through my Food Pics (so cleverly named!) photo file on my computer just now, and came across a picture that is especially salient to me since a) I need to eat more salad, and b) I’m supposed to be packing salad for my lunch tomorrow, but instead am blogging for my #tbt feature. I present…Salad with Pickled Toppings! (again with the clever name) Not sure what else to call it: Pickled Veggie Salad? Pucker Up Salad? Crunch a Bunch Salad? It’s basically your tomato, cucumber, and lettuce salad, topped with homemade pickled beets (future blog post — my mum has the BEST recipe and I’ll pass it on to you), pickled baby onions, and sliced…wait for it…pickles. With a sprinkling of crouton crumbs on top and some Sweet Onion dressing to finish it off. It would never have occurred to me to put pickled beets and onions on salad, or even dill pickles for that matter, but a number of years ago I was visiting relatives in Holland and picked up a ready-made salad for my lunch from a local store. I biked along some canals and ate the purchased salad under the shade of a tree, with a baby lamb keeping me company. Whether it was the company or the view or the appetite I worked up by biking, it was a delicious meal! I tried to recreate that when I came home and came up with a version of this salad, i.e. 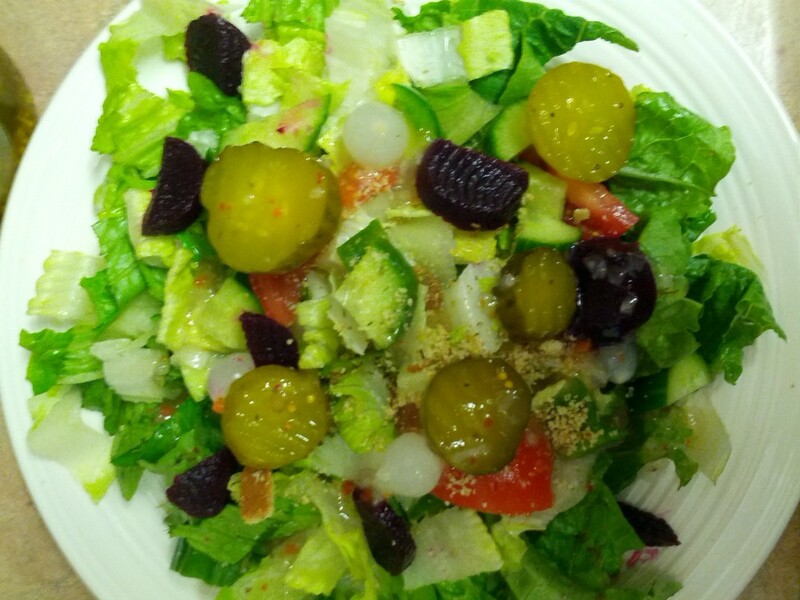 dump pickled veggies of top of a regular salad and enjoy the pucker and crunch! Hey, maybe that’s the new name for it: Pucker and Crunch Salad! I like it! Any opinion about my new salad name? Got your own favourite salad combo? Let me know in the comments! Next Post: Eggplant something. Or Harvest Apple Crumble. Or both, because I’m hungry! This entry was posted in Memories of Meals Past, Salads I Have Known and Loved on October 10, 2014 by Margaret.